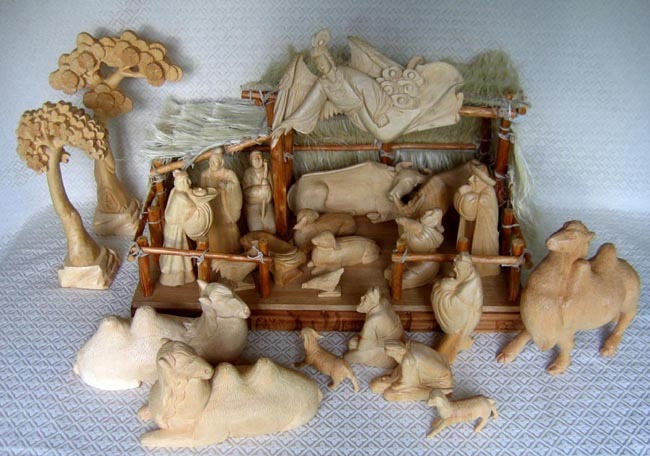 This Nativity scene was designed by a Chinese Christian man. The figures are carved from linden wood. The stable’s base is camphor wood, while the roof and wall covering is hemp fiber. The stable is very large, measuring 15 inches tall by 25 inches long by 15 inches deep. The Joseph figure measures 7.5 inches tall. The flying angel measures 11.5 inches long. The tallest tree stands 14 inches tall.